The term “parenteral maintenance fluid therapy” refers to the necessary water, Na+, K+, and glucose for patients who have “NPO” (nil per os) status. Examples of such situations include the peri-operative period and an altered level of consciousness. Maintenance fluid does not repair deficits, such as those resulting from vomiting or diarrhea. Water requirement is a function of the caloric consumption, which is typically calculated in hospitalized children (higher than that in children with complete rest and lower than that in children with normal activity). Holliday and Segar proposed simple formulations that estimate caloric requirements for hospitalized children based on body weight (Tables 1-2 and Fig. 1)1-2. These formulations provide more calories (fluid) per unit of weight for infants (weight <10 kg) than that for older children (weight >10 kg), Table 2. Energy expenditure can also be estimated from body surface area (BSA): “Caloric requirement = 1,500 to 2,000 kcal/m2/24 h”. The above two solutions are available with 5% dextrose (50 g/L glucose) and 10 or 20 mmol/L KCl. Ringer lactate: Each liter contains 130 mmol Na+, 4 mmol K+, 109 mmol Cl-, and 28 mmol lactate (1/2 of it is available for change to HCO3-). This isotonic solution is suitable for rapid volume expansion. Footnote: Molecular weight of glucose =180 g/mol, Na+ = 23 g/mol, and Cl- = 35.5 g/mol. Thus, 180-gram glucose = 1 mol; 58.5 grams NaCl = 1 mol Na+ plus 1 mol Cl-. Please note for monovalent ions, such as Na+, K+, Cl-, 1 mmol = 1 mEq (these units are used interchangeably). Table 2. Maintenance water requirement for children who have a ‘nil per os’ status . Example: The caloric requirement for a patient who weighs 33 kg is 1,760 kcal/24 h [1,000 + 500 + 260]. Since the calculation is a rough estimate, the number can be rounded-down to 1,700 kcal/24 h or rounded-up to 1,800 kcal/24 h. For children who have a ‘nil per os’ status and are receiving a maintenance fluid containing 5% dextrose, each kcal requires one mL water. Thus, this patient requires 1,700 mL/24 h (70 mL/h). This estimate is more quickly calculated using [40 mL/h (4 mL/kg/h for the first 10 kg) + 20 mL/h (2 mL/kg/h for the second 10 kg) + 13 ml/h (1 mL/kg/h for the remaining 13 kg) = 73 mL/h]. Figure 1: Summary of maintenance fluid therapy. For each kcal consumed, 0.5 mL water is required for insensible water loss (pure water loss) and 0.5 water is required for urine water loss (sensible water loss). Thus, for children on parenteral maintenance fluid therapy, approximately one mL water is required for each kcal consumed. Maintenance Na+ and K+ are required to replace obligatory urine losses. About 2 mmol per 100 kcal of Na+ and K+ are needed. These are supplied as NaCl and KCl. For comparison, human milk and standard infant formulas contain 1.0 to 1.5 mmol Na+ per 100 kcal (or about 6 to 10 mmol Na+/L). In addition, during NPO status, glucose is also required to prevent fatty-acid oxidation and protein catabolism. The above requirements are provided by [5% dextrose, 0.45% NaCl + 20 mmol/L KCl], Table 13-4. This solution can be abbreviated as: [D5W (dextrose 5% in water), ½ normal saline (½ NS) + 20 mmol/L KCL]. It is worth noting that the [5% dextrose, 0.9% NaCl + 20 mmol/L KCl] solution has been recently proposed to reduce the risk hyponatremia in children with conditions affecting antidiuretic hormone (ADH) release or action (e.g., the postoperative period or in the presence of CNS, renal or respiratory disease)8-11. The term ‘insensible water loss’ (water loss through heat dissipation) refers to the continual evaporative water loss through the skin and lungs. It is pure water loss that serves to cool the body temperature to 37oC. For each kcal consumed, 0.5 mL water is converted to vapor to dissipate heat generated from the biochemical reactions. About one third of the insensible water loss is lost through the lungs and two-thirds are lost through the skin. For example, for a hospitalized child with a body weight of 15 kg, the insensible water loss is about 650 mL/24 h (estimated caloric need = 1,250 kcal/24 h, and insensible water loss = 0.5 mL/kcal). About 200 mL of water is lost through the lungs (“inhaling dry air and exhaling wet air”) and 400 mL is lost through the skin. Insensible water loss increases with increased respiratory rate (e.g., newborns and preterm infants) and decreases in humidified air (e.g., mechanical ventilation). It is worth noting that insensible water loss differs from sweat, which is sensible water and Na+ losses, occurring when environmental temperature exceeds 27oC to 35oC. Excessive sweat during prolonged exercise are replaced with commercial electrolyte-containing (sport) drinks. It is also worth noting that the estimated urine water loss in children receiving human milk, infant formula, or regular diet is 1.0 mL/kcal. Thus, total water requirement for these children is 1.5 mL/kcal, which is the usual caloric concentration of human milk and standard infant formulas (0.67 kcal/mL). 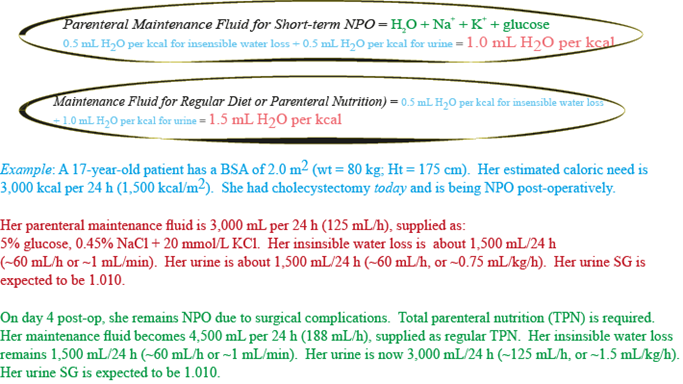 As stated above, estimated ‘urine water loss’ for children who have NPO status and are receiving a glucose-containing solution (parenteral fluid therapy) is about 0.5 mL/kcal. This water is needed to excrete the metabolic solutes (mostly urea) generated during caloric consumption. It produces urine with a specific gravity (SG) of about 1.010 (representing urine osmolality that is similar to plasma osmolality). Thus, a SG of <1.010 signifies a diluted urine and of >1.010 signifies a concentrated urine. Administration of glucose to fasting (NPO) patients decreases protein and lipid catabolism. The minimal amount of glucose required to prevent catabolism in infants is 3 g/kg/24 h and in adults 1.5 g/kg/24 h. Solutions containing 5% glucose (50 g/L) prevent protein and fat catabolism. Thus, maintenance fluid should contain 5% glucose. Normal glucose requirement in children is 4-6 mg/kg/min. Water, Na+ and K+ requirements are higher in patients with renal tubular dysfunction (e.g., sickle cell disease), glucosuria, cystic fibrosis, or GI diseases. These requirements are lower in patients with liver cirrhosis, heart failure, and nephrotic syndrome (salt-retaining states). If urine losses are abnormally high or low, maintenance fluid should replace insensible water loss (0.5 mL/kcal) and measured urine output and urine electrolytes. Infants on whole milk or standard formula need 1.5 mL of water per kcal (0.67 kcal/mL; 20 kcal per oz [oz = 30 mL]), which compensates for the high metabolic solutes (mostly protein) in their diet. Infants and toddlers exchange body water more rapidly than adults do. Thus, their daily water requirement is higher than that in adults. As stated by James L. Gamble, “water flows through infants 2-3 times as fast through adults”5-7. The metabolic rate per unit of weight in infants and young children is about twice as rapid as adults5. Insensible water loss is especially high in the newborn and low birth-weight infants because of their large surface area, thin skin, and rapid respiratory rate. Insensible water loss is also increased in newborns receiving phototherapy. Infants are unable to produce concentrated urine because of a reduced renal tubular water absorption and low release of antidiuretic hormone (ADH). Thus, they are more prone to dehydration during decreased intake, especially in the presence of fever, vomiting, or diarrhea. In conclusion, the above estimates are suitable for children who have a ‘nil per os’ status without water or electrolyte deficits. For these children, ‘parenteral maintenance fluid’ is appropriate. Selecting [5% dextrose, 0.9% NaCl + 20 mmol/L KCl] solution for maintenance fluid is appropriate for children with conditions affecting antidiuretic hormone (ADH) release or action (e.g., the postoperative period or in the presence of CNS, renal or respiratory disease). Repair fluid therapy, on the other hand, refers to replacements during dehydration. Combining maintenance fluid with repair fluid may result in hyponatremia due to rapid infusion of a high volume of the hypotonic solution. For these infants, it is appropriate to complete the repair fluid before considering the maintenance fluid (if needed). Holliday MA, Segar WE: The maintenance need for water in parenteral fluid therapy. Pediatrics 1957; 19: 823-832. Holliday MA, Ray PE, Friedman AL. Fluid therapy for children: facts, fashions and questions. Arch Dis Child. 2007; 92: 546-550. Holliday MA. Isotonic saline expands extracellular fluid and is inappropriate for maintenance therapy. Pediatrics. 2005; 115: 193-194. Holliday MA, Segar WE, Friedman A. Reducing errors in fluid therapy management. Pediatrics. 2003; 111: 424-425. Holliday MA. Gamble and Darrow: pathfinders in body fluid physiology and fluid therapy for children, 1914-1964. Pediatr Nephrol. 2000; 15: 317-3124. Holliday MA. James L. Gamble. J Pediatr. 1993; 122: 156-161. Gamble JL Jr. Sodium and chloride and acid-base physiology. Bull Johns Hopkins Hosp. 1960; 107: 247-254. Neilson J, O'Neill F, Dawoud D, et al. Guideline Development Group. Intravenous fluids in children and young people: summary of NICE guidance. BMJ. 2015; 351: h6388. Foster BA, Tom D, Hill V. Hypotonic versus isotonic fluids in hospitalized children: a systematic review and meta-analysis. J Pediatr. 2014; 165: 163-169.e2. https://www.uptodate.com/contents/maintenance-fluid-therapy-in-children; accessed on 21 January 2019. Feld LG, Neuspiel DR, Foster BA, et al. SUBCOMMITTEE ON FLUID AND ELECTROLYTE THERAPY. Clinical Practice Guideline: Maintenance Intravenous Fluids in Children. Pediatrics. 2018 Dec; 142(6). doi:10.1542/peds.2018-3083.